Now that the team is back from releasing thirty one rehabbed turtles in Florida. We have been able to look through some of our photos and are now able to start sharing them with you. Enjoy the pictures! On the way south. First major obstacle to get over is the George Washington Bridge! Looks like the turtle gods were with them. In order to accommodate the number of turtles the caravan consisted of three vehicles. Upon arrival at Little Talbot Island the park rangers assisted us with getting the turtles over the dunes to the release site. 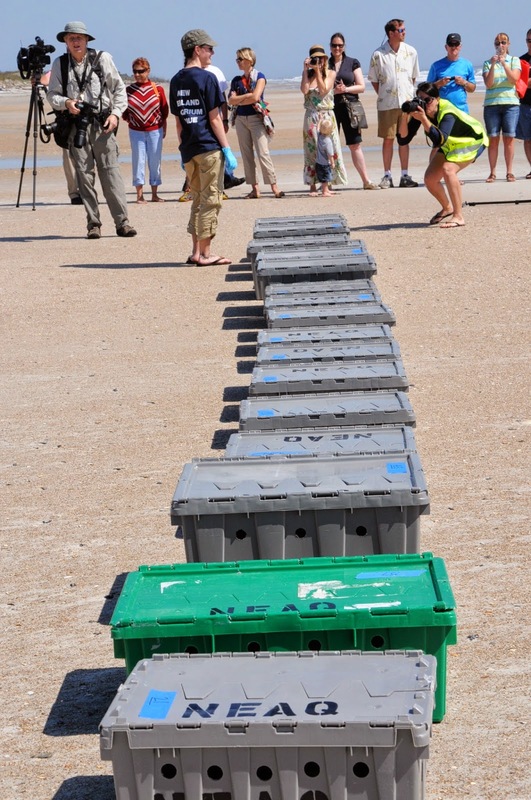 Lining the turtles up and getting them ready to send home to the Atlantic! After twenty four hours of driving, a couple of hours setting up the the release site, and the successful release of thirty one endangered sea turtles a well earned celebration takes place! See all of the 2013 Cold Stun sea turtle season posts here.